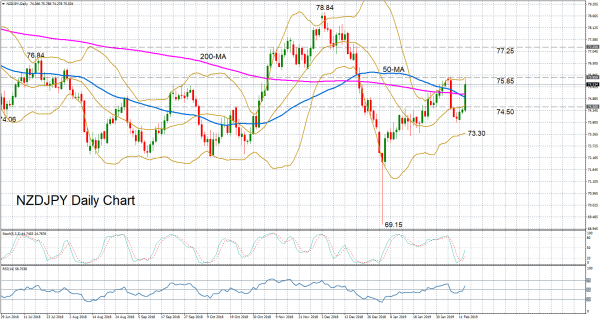 NZDJPY is looking strongly bullish in the short term after surging above its daily moving averages (MA) on Wednesday. Prices hit a one-week high of 75.79 and the technical indicators are all pointing to further positive momentum in the near term. The stochastics are heading upwards, but the %K line has yet to cross above 50, suggesting plenty of scope for additional upside moves. The RSI has crossed into bullish territory but has yet to approach the 70 overbought level. Immediate resistance to further gains would likely come from the upper Bollinger band, around 75.85, which capped prices earlier today. This is also near the February 6 peak of 75.90 so this could prove a potentially difficult hurdle for the pair to overcome. If there is a successful break above this area, further resistance could be met around 77.25, which was a congested region during November and December. Higher up, the December top of 78.84 – a 7-month high – would be the next target. If, however, the strong upside momentum was to lose steam and the pair reversed lower, support would initially come from the 20-day MA, also the middle Bollinger band, around 74.50. Slipping below this level could take prices towards the lower Bolling band at 73.30. Failure to hold inside the Bollinger bands would switch the focus back to the downside and attention would increasingly turn to the 2½-year low of 69.15 reached in early January. In the more medium-term picture, the bearish outlook recently shifted to a neutral one and is likely to stay neutral as long as prices remain close to the 50-day MA.